The Haddonfield Japan Exchange was formed in 2006 and has since been hosting a program that allows Haddonfield students to go to Japan every other year, while students from Japan visit Haddonfield during the off years. The program has continued to evolve, and this year’s trip saw the inclusion of a few initiatives that have greatly increased the education and enjoyment for the students. It isn’t the first time the students have been asked to keep journals, but it’s one of the first times those entries have been able to be shared so quickly. With the constant communication, Brown feels the HJE will be able to understand what works the best for the students. Between the journals and the post-trip survey, Brown has been able to narrow down some of the most significant aspects of the trip, which he says has surprised him. Every student going to Japan as part of the HJE program is assigned an individual host family. In many similar programs, there are a few students assigned to each host family. The tactic seems to be working, as Brown sees almost all-positive feedback from the students. Next summer, Haddonfield will again play host to Japanese students. 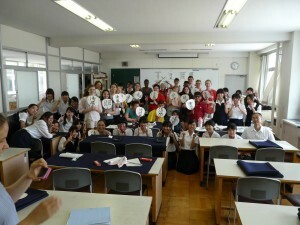 To learn more about the HJE, visit www.facebook.com/HaddonfieldJapanExchange.